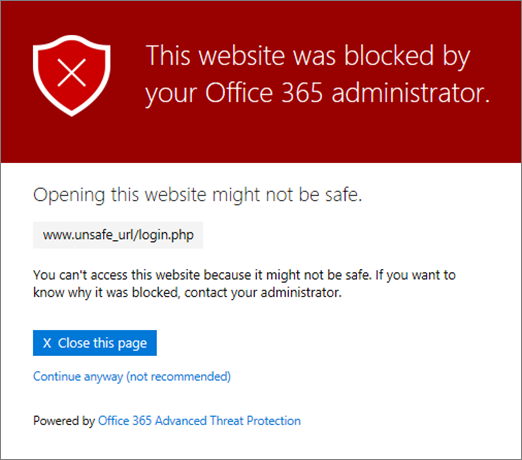 The blocked URLs list is defined by your organization's Office 365 security team, and that list applies to everyone in the organization who is covered by Office 365 ATP Safe Links policies. 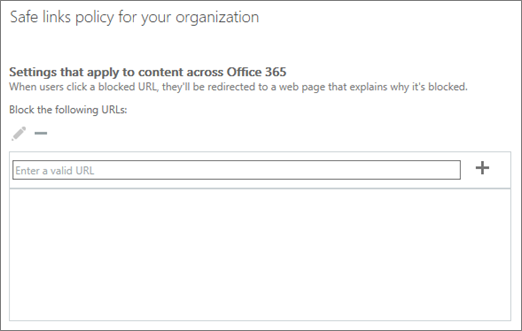 Read this article to learn how to set up your organization's custom blocked URLs list for ATP Safe Links in Office 365. ATP Safe Links in Office 365 uses several lists, including your organization's custom blocked URLs list. If you have the necessary permissions, you can set up your organization's custom list. You do this by editing your organization's default Safe Links policy. This enables you to view your list of blocked URLs. At first, you might not have any URLs listed here. Select the Enter a valid URL box, type a URL, and then choose the plus sign (+). Do not include a forward slash ( /) at the end of the URL. For example, instead of entering http://www.contoso.com/, enter http://www.contoso.com. You can specify a domain-only URL (like contoso.com or tailspintoys.com). This will block clicks on any URL that contains the domain. You can specify a subdomain (like toys.contoso.com*) without blocking a full domain (like contoso.com). This will block clicks any URL that contains the subdomain, but it won't block clicks to a URL that contains the full domain. You can include up to three wildcard asterisks (*) per URL. The following table lists some examples of what you can enter and what effect those entries have. Blocks a subdomain ("toys" in this case) but allow clicks to other domain URLs (like http://contoso.com or http://home.contoso.com). If you want certain groups to be able to view URLs that might be blocked for others, you can specify an ATP Safe Links policy that applies to specific recipients. See Set up a custom "do not rewrite" URLs list using ATP Safe Links.